IBM presents Harvard University their Automatic Sequence Controlled Calculator (ASCC), an electro-mechanical computer devised by Howard H. Aiken and built by IBM. Harvard renamed the ASCC the Harvard Mark I. 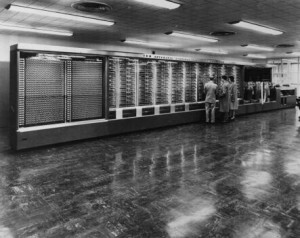 The Mark I was not significant for technological advances, as the fully-electronic ENIAC was being constructed when the Mark I was being put into service. However, the Mark I was the first large-scale digital calculator ever built and served to spark the desire for more and better computing machines.